our favorite way to book our trips. They have discount Disneyland Tickets and a Best Price Guarantee on their packages, so you know you are getting the best deal. Plus, on the rare chance you find a cheaper price somewhere else, they will beat it. You can even use promo code ThriftyNW to get an additional $10 off your hotel and tickets package. Disneyland is making it faster, and easier to get on rides with the MaxPass offering now too! Disneyland is always coming up with new ways to improve the park and enhance your experience. Recently they introduced the MaxPass to the Resort, and it is a game-changer! We’ve gathered everything you need to know about MaxPass to make the most of your trip. 1. 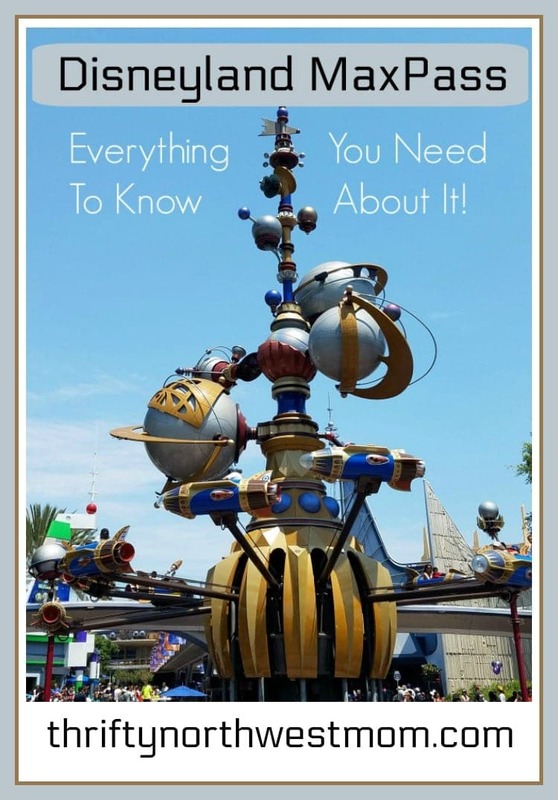 It’s only available when you are inside the parks, so you cannot purchase it before your trip. You will have the opportunity to purchase it through the Disneyland App when you arrive. Unlike normal Fastpasses, the MaxPass is not included in your ticket. The cost is $15/day per person. This price isn’t permanent and we expect it to go up in the future, but there is no word of the price increasing yet. When you purchase MaxPass, you get PhotoPass included. This means you get unlimited downloads of any pictures taken of you that day. The PhotoPass alone is worth the $15 a day, so you are getting an incredible value with the MaxPass. 2. You won’t have to go to a Fastpass kiosk when retrieving your Fastpasses. Everything is done digitally and the moment your next Fastpass is available, you can reserve it – all with your phone! That means if you are in line for a ride, you can get your next Fastpass right there, all with the touch of a button. You can reserve them for either park, no matter which park you are in at the time. If you are in line at Space Mountain and you want to make a Fastpass reservation for Radiator Springs Racers, no problem. As long as those Fastpasses are available you can get them. Keep in mind that the Fastpasses from the MaxPass are pulling from the same pool as the normal Fastpass system so availability can run out. your party’s Fastpasses, or you can each scan your park ticket like you would a normal Fastpass. Whichever way you choose, it is super simple! It is important to mention that you definitely don’t need to use MaxPass every day you are in the park. We recommend using it the first day you are in the parks to experience all your favorite rides that offer Fastpasses. And, during this first day take all the PhotoPass pictures you can for your download! Not only will it save you money using it for just one day during your trip, but you will still get all the perks. The new digital Fastpass system is really easy to navigate and just as great as Fastpasses have been in the past. We are so excited for the MaxPass and can’t wait to try it out at the parks! When you decide to head to the park, book your Disneyland package with Get Away Today. They have discount Disneyland tickets and reduced hotel rates making your trip not only magical but affordable. Plus, you can use promo code ThriftyNW for an additional $10 off your vacation package. That’s the cost of using one full day of MaxPass! Give their agents a call at 855-GET- AWAY or go online to getawaytoday.com to book your package. Happy travels! Be sure to check out our Disneyland Deals page too, for LOTS of tips on how to save the most on a Disneyland Trip!